As widely expected, the Fed hiked rates once more this year. At the same time, the Fed’s dot plot moved lower over the forecast horizon. These changes are consistent with a softer inflation and economic outlook. Data came in broadly positive, with housing starts and home resales both defying weaker market expectations. Consumer spending remained hot in November, with consumption looking set to advance by a sturdy 4% (annualized) in Q4. 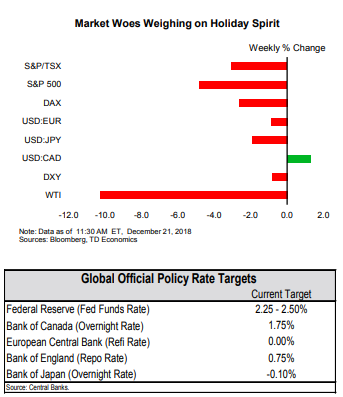 The late-year equity market sell off continued this week, with looming risks for a partial government shutdown marking the latest in a series of factors that are likely to weigh on sentiment through the New Year. It was a busy data week, but the FOMC meeting was the main event. 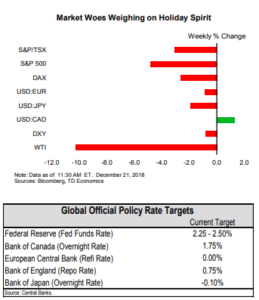 As widely expected, the Fed hiked rates for the fourth time this year, lifting the upper bound of the fed funds rate to 2.5%. More interesting was that the Fed’s dot plot, which shows members’ expectations for future rate increases, shifted lower in 2019. The median expectation is now for two hikes, down from three previously. The expectation for the longer-run level of the fed funds rate also moved down 25 basis points to 2.75%. Consistent with these changes are a slightly more subdued price outlook and slightly higher unemployment rate, both a sign of a softer economic outlook in the years ahead. The Fed’s dovish tone with respect to future hikes did little to appease investors. 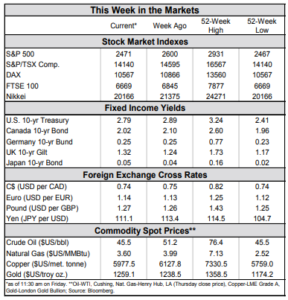 Both U.S. and international equity markets extended their losing streak on the news. It should be noted, however, that the path of interest rates is not set in stone, with the Fed placing a greater emphasis on data-dependency. As Fed Chair Powell put it, from this point on “we’re going to be letting the data speak to us”. Speaking of data, this week’s releases continued to confirm several running themes. First, inflation remains near target but has softened lately. 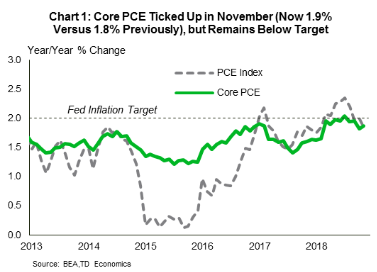 The core PCE prince index, the Fed’s preferred measure of inflation, edged up in November, but still fell short of target (Chart 1). Secondly, U.S. consumer spending remains hot. Real spending was up 0.3% in November. 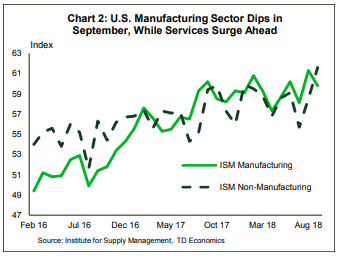 With two months in the bag, consumption looks set to advance by close to 4% (annualized) in the final quarter of the year, better than previously expected. This brings our tracking for real GDP for the same quarter up to 2.8% – a deceleration from the third quarter (3.4%), but enough to keep growth at 2.9% for the year. Third, the housing market remains soft but recent improvements are encouraging. Both housing starts (3.2%) and existing home sales (1.9%) rose in November, besting market expectations. On a less positive note, starts were propped up by the volatile multifamily segment (single-family starts fell for a third straight month), while home resales are still down between 3% and 15% year-on-year across major U.S. regions. As the sugar high from monetary and fiscal stimulus wears off, we expect growth to slow to a still-healthy 2.5% in 2019. But, several potential potholes lie in the path ahead (see here). The latest spending bill impasse, which could lead to a partial government shutdown, is but one example. Given that shutdowns typically prove to be short-lived, history suggests limited economic impact. However, the hit to market confidence could prove more damaging. Given expectations for slowing growth and the pronounced late-year selloff in equity markets (Chart 2), the “recession” word has gained traction recently. Our recent look at a broad range of indicators points sees little evidence for this in the economic data. That said, negative expectations have the potential to become self-fulfilling. But for now, the only thing we have to fear is fear itself. Overall, the U.S. economy is strong, and the Federal Reserve is well justified in raising rates another quarter point at its meeting next Wednesday. The real question is how the FOMC’s views have changed about how much further rates need to rise. 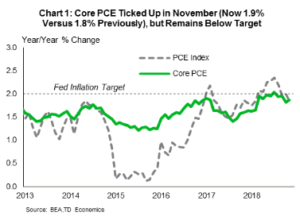 Given the fairly benign inflation backdrop recently, we expect the Fed to hike rates more gradually in 2019.